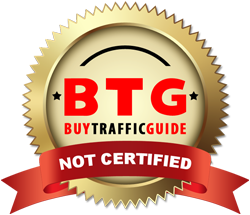 If you do not receive all of the traffic or Youtube service you purchased, you will receive a refund of the undelivered traffic. We will only accept visitor logs from Statcounter.com. If using another visitor counter tool, we will not provide you a refund. Statcounter.com is very accurate in tracking visitors while other services are not very accurate. We are not responsible for the effectiveness of your web site, nor its ability to convert traffic into members, subscribers, customers or clients.